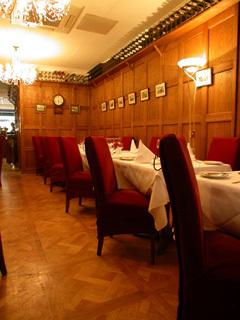 Mr Alistair Greig established this restaurant in the 1950s; the highly acclaimed restaurateur soon established a reputation for serving the finest steaks in London using only the very best meat. More than half a century later, Greig’s restaurant continues to uphold Alistair’s tradition of top quality steaks and British food. The extensive refurbishment of Greig's Grill has created an intimate, stylish atmosphere with a confident and relaxed ambience. The main dining room features a traditional stained glass window, which is lit in the evenings, chandeliers and original oak panelling to ooze charm and the air of tradition. The décor achieves minimalism and elegance in equal measures. Staff are polished, professional with a cheery attitude. There's a bar, which is perfect for pre-post dinner drinks and blistering cocktails. Terrace seating is available weather permitting. Greig�s features two immaculately appointed private dining rooms. The wine room seats eight to ten guests and features an open fire, traditional chandeliers and is fully oak panelled. An interior glass wall exposes the restaurant's 3000 bottle wine cellar, which contains an impressive number of rare Bordeaux. The Oak Room as it's name suggests is a fully oak panelled room that seats around 18 guests with 19th century hunting prints and a glass chandelier. The menu emphasis is entirely on classically prepared Scotch steaks hung for a minimum of two weeks. There�s a good selection of fish and British specialities. Traditional English Roast Beef with Yorkshire pudding is available in the evenings as well as Sunday lunch. A cheese board of fine British offerings sits well with the menu, and puddings are simple and designed to complement the full effect.